QUEENSLAND'S treasured tourist beaches face their most severe erosion threat in decades as Tropical Cyclone Oma edges closer to the coastline. 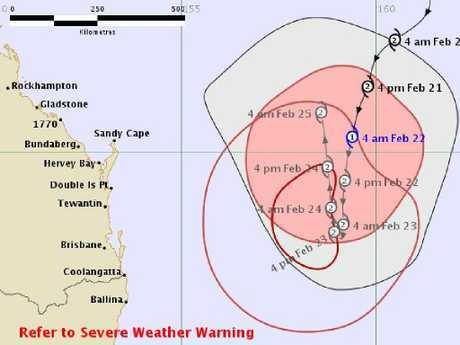 While the Bureau of Meteorology has cancelled its Cyclone Watch warning and forecasts that Oma will remain offshore this weekend, fears are growing it may have a devastating impact on the southeast's foreshores. It is located 720km northeast of Brisbane and travelling south, south-west at 13km/h. It is expected to re-intensify to Category Two through today and continue moving in a generally south to south-westerly direction into early Saturday. The Bureau of Meteorology's 5.30am forecast predicting the path of Cyclone Oma. BoM forecaster Lauren Pattie said Oma would this morning bring stronger winds, even more powerful waves and showers than were experienced on Thursday, emphasising that longer-range predictions of its path remained uncertain from Sunday onward. "A couple of models show it heading north and one has it going back out into the Coral Sea," she said. Southerly winds will increase to 75km/h across the southeast today, with seas rising to 4-7m. Tomorrow will see winds strengthening to 85km/h and seas surging to 6-8m. A tropical cyclone watch is now in place covering the coast from Bundaberg in Queensland to Ballina in northern NSW. 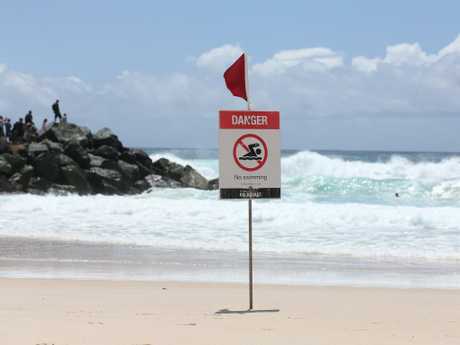 All beaches have been closed, and Surf Life Saving Queensland has suspended all lifesaving duties, including training in creeks and rivers, for the next three days. 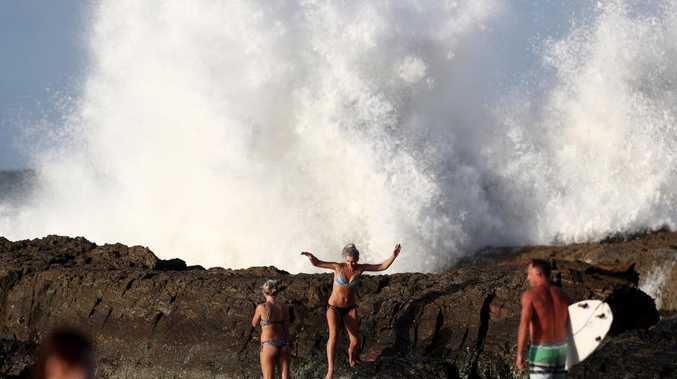 Leading surf forecaster Ben Macartney, of Coastalwatch, said a cyclone behaving like Oma was unprecedented in this area. 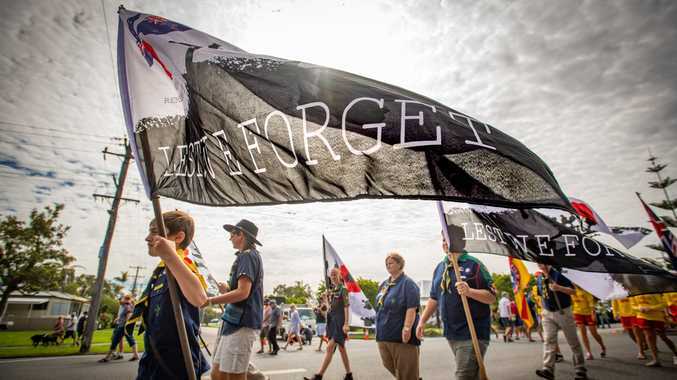 Mr Macartney said he had not found any precedents in terms of a system creeping up so slowly and hovering offshore, driving sustained giant swells at the Sunshine and Gold coasts. He said the relentless pounding, combined with king tides, was set to cause the worst erosion in decades. "It's phenomenal really," Mr Macartney said. "We are looking at an exceptional swell event. "It's going to get more chaotic and there will be a lot of water movement and damage to the coastline. "It is easily our most severe erosion event in decades." The Gold Coast's $20 million beach protection defences will face their toughest test. In 2013, Cyclone Oswald's fury carved a swath of destruction across Glitter Strip beaches, robbing the Gold Coast of its most valuable tourism asset for weeks. Now, as Oma tracks towards southeast Queensland, measures put in place since that disaster are in line for a severe battering. However Gold Coast Mayor Tom Tate said he was confident the beaches would cope.